Today I am literally running late. Last night I took your mom to watch Les Miserables downtown and the subway broke down on the way home. We got home pretty late. I still woke up at 5AM today. I wanted to write a summary of the three presentations I gave at work this week. I am definitely going to talk to you about values when you are really young, but I also want you to read my previous post on your first day at work. Once I have the details worked out, I am going to modify that half hour into a quick orientation session to our new hires. That can help me connect and also establish individual goals, at the same time outlining corporate guidance and mission. 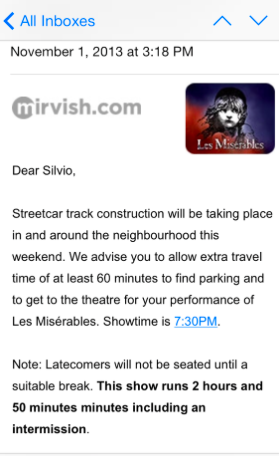 I am not going to review Les Miz… I am not a critic. I may post something about inspiration and motivation but I am not sure… I would have to tell you something really embarrassing in order to do so… we will see. Going for my run now. Posting the picture here after I get back, in edit mode. 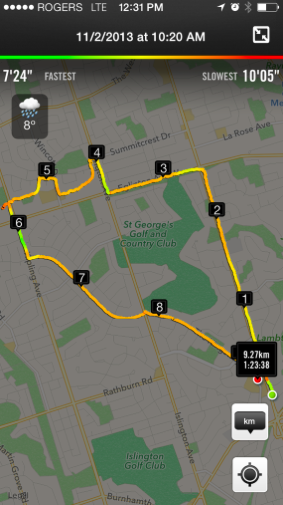 I added an uphill portion at Summicrest (from 4 to 5). I have to remember to wear a hat next time I go running in the rain. I stopped by the liquor store on the way back and got your mom a bottle of Moscato. I am contemplating a new goal: Run the Boston Marathon when I am 50 years old. I know I have to work on my time and form. I never ran a marathon before and I am sure I am going to run a couple before I turn 50, but I am going to save Boston for that year. I decided to post about Les Miz later… the embarrassing part: I am going to make a reference to Dawson’s Creek.